I'm reading Susan Howe's Melville's Marginalia. Years ago, at the start of my own antiquarianism, I got deeply into writers' marginalia myself.I'm reading Susan Howe's Melville's Marginalia. Years ago, at the start of my own antiquarianism, I got deeply into writers' marginalia myself. 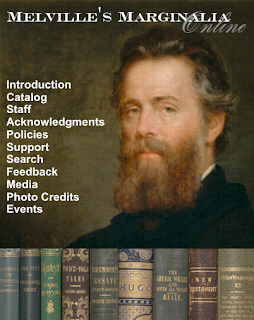 I looked into Melville's reading, as have many scholars over the decades. He was one of those who left traces of his responses to reading. This morning I went to the web--of course--following an impulse to see if the scholarship was still out of the way, out of print, hard to find - itself, in short, marginal. But no. There's a fabulous web site that shows us everything. Here's your link. Go deep.